An integral part of life is feeling well and being happy. 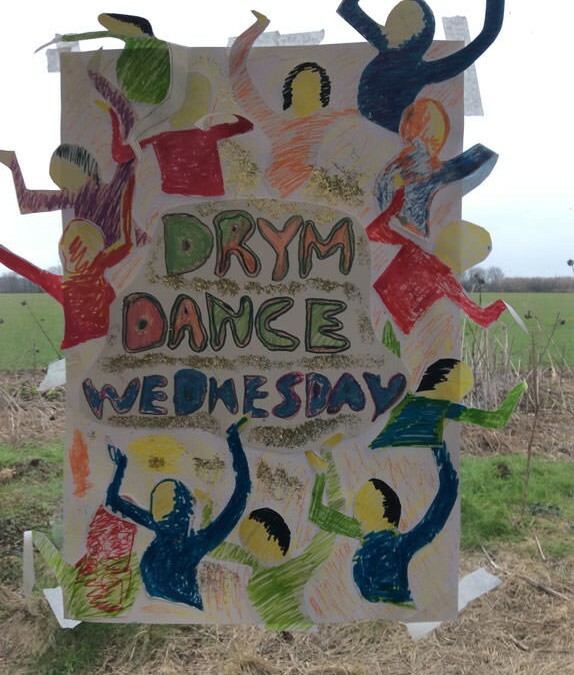 To compliment the wide variety of creative and practical activities at Drym Valley, we offer yoga, relaxation and meditation, football coaching, cycling, walking, swimming, camping, sports sessions and dance. Every Friday afternoon by our experienced, fully qualified instructor. Junglee supports and helps all new additions to the group, a variety of poses and deep breathing techniques. In the summer months, the sessions are outdoors, where often we are lucky to practice our Sun Salutation! These sessions are held in silence and last one hour. The group room is prepared with low lighting by candles and incense . We practice guided visualisation, deep breathing, dancing and then listen to meditative music. These sessions greatly alter the energy of the group and is very beneficial at the end of a busy day. This high energy activity takes place at Cornwall College astro pitch during the spring, summer and autumn months and at Carn Brea sports hall during winter months.The session lasts one hour and involves a brief warm-up with a short training drill followed by 2 simultaneous games, one at championship level and the other at league 1-2 level. The session is often attended by 20-25 players and support workers, who come independently from the community as well as from Kehelland, ROC, Murdoch and Trevithick and choices at Camborne, Redruth and Truro.The session is run by a qualified F.A. coach. All welcome.Contact Warren Parker at the Cornwall F.A. on 01208 26298 for more information.We transport Drym clients to and from each session. We placed an article in the West Briton recently for old bikes. We were inundated with an amazing donation of around 20 bikes, a tricycle and bike trailer We currently use 10 regularly.Our volunteer, Gary, a keen cyclist himself has started a bike maintenance and cycling group on Tuesdays. This starts with how to inflate the tyres, check the brake and gear cables, oil the chain and make any adjustments to the bike.Our plan is to start a regular cycle group to engage other centres and clubs. The ultimate aim is a sponsored coast to coast cycle.So if you haven’t been on a bike for a while, lost your confidence or just want to service your own bike, it’s all here at Drym. Whether it is a small group to stroll around our ideal area, taking in the gentle quiet lanes and accompanied by the dogs or alternatively a 1/2 day walk when we take our packed lunches and walk 5-6 miles. Walking or rambling is great fun, burns lots of calories and reminds us what a great area we live in. More often that not a seasonal activity. We use the small outdoor pool at Hayle on Wednesdays throughout the summer months. Last year we were lucky enough to use the indoor pool at Murdoch and Trevithick centre in Redruth on Tuesdays and Thursdays. Swimming is great for aches and pains or freeing up any stiff joints. All sessions are supervised by staff and in the prescence of a lifeguard. During summer months for 1 night at a time often on a Friday evening, set-up your tent, prepare the BBQ, roast marshmallows and sing around the camp fire. The include Boccia, Gym skills and Rounders. These monthly sessions are during term time facilitated by Jamie, the sports maker from college. On Mondays 11-12 provided by Inspire-Cornwall* with the lovely Jaydene.Informal music and movement on Wednesday.On Friday, 11:00 – 12:00, Zumba sessions held in Gweek village Hall**Inspire Cornwall C.I.C. is a specialist, local Community Interest Company working with groups of vulnerable adults. Their aim is to engage and motivate people so that they can develop their aspirations and reach their potential. They do this by providing information, activities, products and services that build self-confidence, awareness and knowledge.